New at Aldi is this catchily named coconut Coco Loco priced at £1.79 for 1ltr. Claiming to be “Natural Coocnut Water” NOT from concentrate, this UHT Coconut drink is made up of 99% Coconut Water with Fructose and Ascorbic Acid making up the rest. It tastes not very coconutty at all, very bland, not sourish like some but with a very slight background taste of something slightly coconut like, but overall very very bland. As with most things(and especially coconut water) fresh is best, even if its packaged 100% its never gonna taste the same. I actually had a fresh young coconut just last week(£1.99 at the Asian store), cracked it open, drunk the juice and peeled the soft flesh and I can tell you the difference in taste is huge. 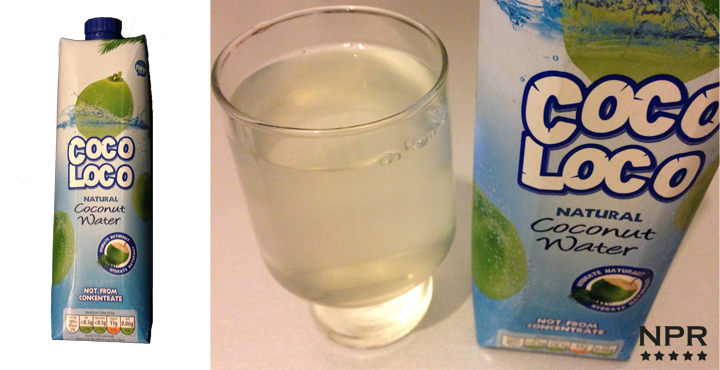 This tastes like dirty dish water at times but so do most and like I’ve said a million times with Coconut Water before, its all about the health benefits, because if you’re drinking it thinking the flavour will whisk you away to a Caribbean Paradise…then think again. If you want a coconut water that tastes how you think and hope it would tastelike then stick to the less percentage juices like the Rubicon one.